With the smart watch from Samsung expected to launch on September 4, the alleged app to manage the watch from the smartphone has been spotted, thus confirming the existence of the watch. 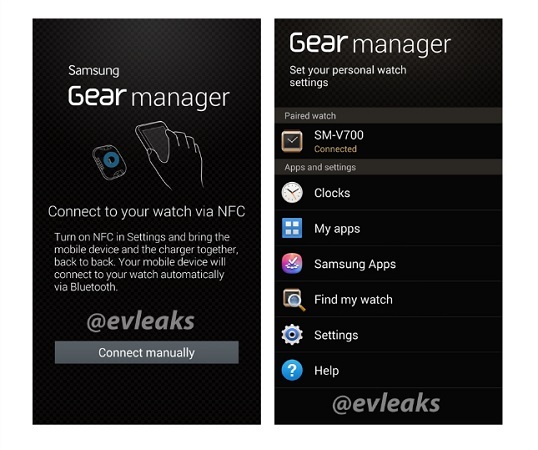 Our trusted sources has leaked the screenshots of the Galaxy Gear Manager Smartphone app and has revealed a few details about the Galaxy Gear smart watch. While we were not sure about the Galaxy Gear branding for the smart watch, the app clearly mentions the name. The alleged watch connected to app has model number SM-V700, which has surfaced earlier. The app allows for connecting device using NFC or Bluetooth besides connecting manually. The app contains various app like Clocks, My apps, Samsung Apps, Settings and Help. Interestingly, there is also a Find my watch option, which as you can guess would be used to track the watch. We are really hoping for the watch to be launched at Samsung’s UnPacked event in Berlin on September 4.